There are more than 65 million people worldwide who have been displaced either within their own country or outside of it, resulting in what the UNHCR calls "immense human suffering." According to the National Public Radio, "one in every 113 people on Earth has now been driven from their home by persecution, conflict and violence or human rights violations," and that every twenty-four minutes, a person is forced to flee their home. The UN says that this situation is unprecedented in world history (Domonoske). In stark contrast to the number of displaced people, the number of those who are granted asylum is far lower. A mere 0.66% of the world's refugees - the "lucky ones" - are resettled. 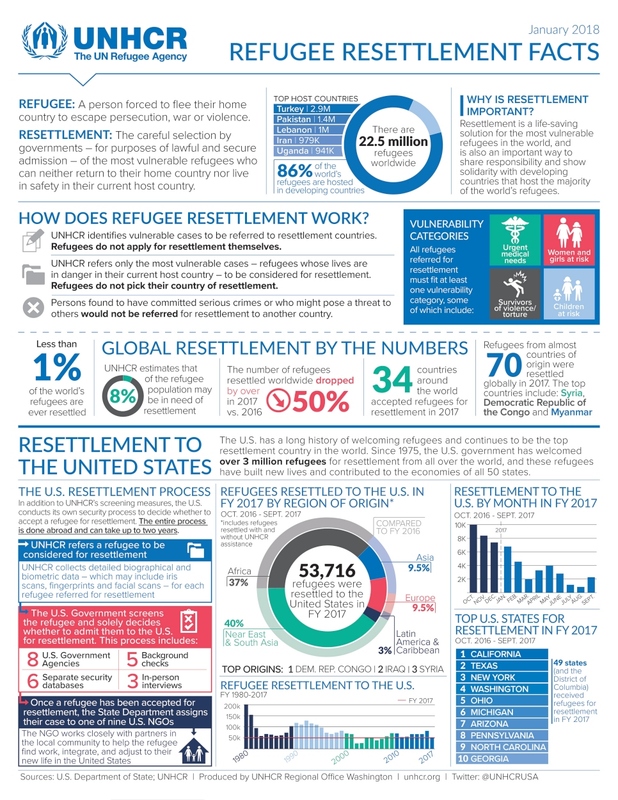 Of the 50 million resettled refugees estimated by UNHCR, the United States has received approximately 3 million since 1975. Some 100,000 are resettled in the United States every year. Although the September 11 attacks dramatically decreased the number of refugees who were allowed to enter the United States, the years following have seen a steady increase in the number of individuals welcomed to our haven. From 1990-1995, there were some 112,000 refugees brought into the US each year. This number dropped to 27,000 following 9/11, but has trended upward since, close to the six-figure mark (Krogstad and Radford). Under the current presidential administration, there have been several attempts to block as many refugees as possible, putting individuals from certain countries through "extreme vetting." In addition to travel bans, President Trump has set caps on the number of refugees that can be accepted. Though presidents were given the power to do this in 1980, President Trump has set historically low numbers. From his inauguration day to December 31, 2017, 29,022 refugees were accepted - nearly as low as the 27,000 admitted in the year following the September 11th attacks (USA Today). Refugee acceptance is expected to diminish to less than half that of previous administrations. For comparison, even with lows following 9/11, the average number of refugees admitted per year has been 75,000. President Trump has placed a 45,000-person limit for 2018, a number that he is far from reaching. In the fiscal year to date (October through March) only 10,548 refugees have been admitted to the United States (Refugee Processing Center).